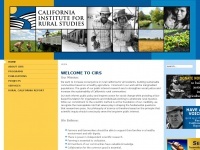 CIRS is the only non-profit organization in California with a mission to conduct public interest research that strengthens social justice and increases the sustainability of Californias rural communities. two profiles were found for Cirsinc.org in social networks. Among other social networks the website is represented in Facebook and Twitter. The web server used by Cirsinc.org is located in Houston, USA and is run by CyrusOne LLC. On this web server 13 other websites are hosted. The language of those websites is mostly english. A Nginx server hosts the websites of Cirsinc.org. For managing the data of the webpages the CMS Joomla! is used. The website uses the latest markup standard HTML 5. The website does not specify details about the inclusion of its content in search engines. For this reason the content will be included by search engines.